ISIL counter-attack in Fallujah: can Iraqi Forces maintain momentum? The London pan-Arab daily al-Hayat [Life] reports that Iraqi troops are advancing on Fallujah despite facing fierce resistance from Daesh (ISIS, ISIL) . At the same time, fear is mounting abot the fate of the tens of thousands of non-combatants inside the city who are caught between the advancing Iraqi forces and violent Daesh resistance. 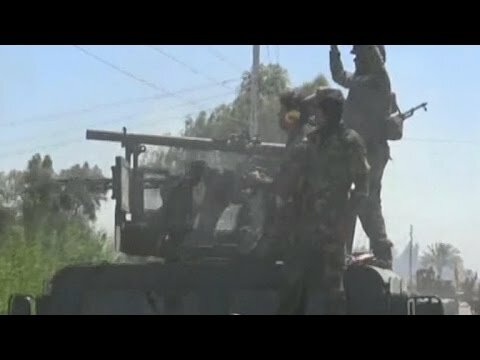 After the beginning of the attack operations on Monday from three directions, it was the units advancing from the south that made the biggest breakthrough, taking the Na`imiya Bridge. Lt. Gen. Abd al-Wahhab al-Saedi, the officer commanding the operations, that his forces were encountering violent resistance from the terrorist organization’s gunmen. He explained that the gunmen had launched a counter-strike to the south of the city. He said, “About 100 Daesh militants executed an assault without deploying car bombs or suicide attacks.” He affirmed that the Iraqi army blunted the attack and killed 75 of the armed men, then continued their advance toward the city. He did not say how many casualties were taken by the Iraqi army side. The counter-attack was stopped in part by precision bombing by the US and its allies, and by Iraqi army deployment of helicopter gunships. The Iraqi military and the Shiite militias supporting it imposed a blockade on Fallujah several months ago to soften it up for this campaign. Daesh has held Fallujah since January of 2014. A source inside Fallujah told al-Hayat that the local population is eagerly awaiting their liberation from the clutches of Daesh. Abu Muhammad al-Dulaymi said that the locals were disgusted that they had not already been rescued by government forces, since Daesh rule is harsher on them every day and they are terrified of the organization. “Daesh,” he said, “are furious that they are not getting support from the local population.” They’ve started just cursing people in the street. The locals are under artillery barrages from the Iraqi army and in danger from Daesh fighters who feel trapped. Daesh just rounded up a hundred men for being lukewarm toward them, and have made them disappear. They have also conscripted young men to fight for Daesh. In the past week, 3700 civilians have managed to flee the city, but they lived on its outskirts. People living inside Fallujah are finding it almost impossible to get out. In the center of the city, where Daesh fighters are dying from US and allied air attacks, Daesh is using civilians as human shields.